We will not send you any unsolicited commercial email unless you have given your prior consent. We will seek to act in the best interest of our customers, and will not abuse our position of data controller for any commercial gain. Your access to and use of Ski Swift is subject exclusively to these Terms and Conditions. You will not use the Website for any purpose that is unlawful or prohibited by these Terms and Conditions. By using the Website you are fully accepting the terms, conditions and disclaimers contained in this notice. If you do not accept these Terms and Conditions you must immediately stop using the Website. Many of the flights and flight-inclusive holidays on this website are financially protected by the ATOL scheme. But ATOL protection does not apply to all holiday and travel services listed on this website. Please ask us to confirm what protection may apply to your booking. If you do not receive an ATOL Certificate then the booking will not be ATOL protected. If you do receive an ATOL Certificate but all the parts of your trip are not listed on it, those parts will not be ATOL protected. 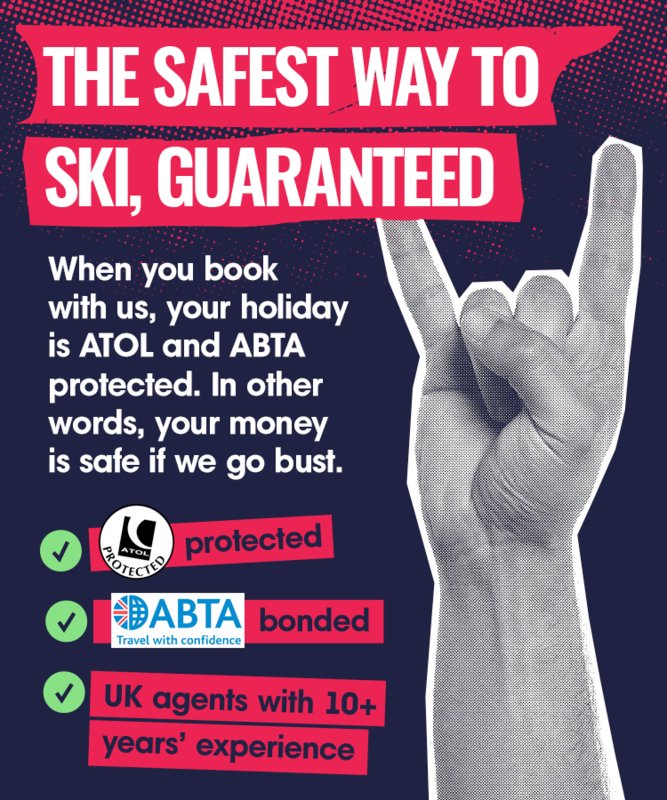 Please see our booking conditions for information or for more information about financial protection and the ATOL Certificate go to atol.org.uk/ATOLCertificate. The contents of Ski Swift website do not constitute advice and should not be relied upon in making or refraining from making, any decision. We are provided with our property details from our suppliers at the start of each season with 'offers' that 'may' be available at certain times throughout the year. As these offers can be added or removed at any time, and predominantly out of our control, the only 'true' way of questioning what 'offers' are available is via our call centre. Our call centre information systems are 100% live and all information quoted over the phone is on 'as is' basis and by that we mean all quotes and offers are only valid for the duration of the call. Change or remove (temporarily or permanently) the Website or any part of it without notice and you confirm that Ski Swift shall not be liable to you for any such change or removal and. Ski Swift Website may include links to third party websites that are controlled and maintained by others. Any link to other websites is not an endorsement of such websites and you acknowledge and agree that we are not responsible for the content or availability of any such sites. All copyright, trade marks and all other intellectual property rights in the Website and its content (including without limitation the Website design, text, graphics and all software and source codes connected with the Website) are owned by or licensed to Ski Swift or otherwise used by Ski Swift as permitted by law. To the extent permitted by law, Ski Swift will not be liable for any indirect or consequential loss or damage whatever (including without limitation loss of business, opportunity, data, profits) arising out of or in connection with the use of the Website. Ski Swift makes no warranty that the functionality of the Website will be uninterrupted or error free, that defects will be corrected or that the Website or the server that makes it available are free of viruses or anything else which may be harmful or destructive. Nothing in these Terms and Conditions shall be construed so as to exclude or limit the liability of Ski Swift for death or personal injury as a result of the negligence of Ski Swift or that of its employees or agents. You agree to indemnify and hold Ski Swift and its employees and agents harmless from and against all liabilities, legal fees, damages, losses, costs and other expenses in relation to any claims or actions brought against Ski Swift arising out of any breach by you of these Terms and Conditions or other liabilities arising out of your use of this Website. Ski Swift respects your privacy. Any personal information you provide to us including and similar to your name, address, telephone number and e-mail address will not be released, sold, or rented to any entities or individuals outside of Ski Swift. Please note that during your visits to our website you may notice some cookies that are not related to directly to us. When you visit a page with content embedded from YouTube, Flickr or one which has a "Share" button, you may be presented with cookies from these websites. We have no control of these cookies and you should check the third party websites for more information about these. Alternatively, you may wish to visit http://www.aboutcookies.org which contains comprehensive information on how to do this on a wide variety of browsers. You will also find details on how to delete cookies from your computer as well as more general information about cookies. For information on how to do this on the browser of your mobile phone you will need to refer to your handset manual. We use Google Analytics to monitor traffic levels, search queries and visits to this website. Google Analytics stores IP address anonymously on its servers in the US, and neither Ski swift or Google associate your IP address with any personally identifiable information. These cookies enable Google to determine whether you are a return visitor to the site, and to track the pages that you visit during your session. While we do our best to protect your personal information, we cannot guarantee the security of any information that you transmit to Ski Swift and you are solely responsible for maintaining the secrecy of any passwords or other account information. In addition other Internet sites or services that may be accessible through Ski Swift have separate data and privacy practices independent of us, and therefore we disclaim any responsibility or liability for their policies or actions.